Some spontaneous excerpts, interchange amongst Saints... :) To Believe we must declare in our hearts that: I have given my life to Jesus and I WILL have every single thing He wants me to have and not one thing less than what He wants me to have. He is God! No set of circumstances can keep me from having exactly what He wants me to have! It's a settled fact! AND if my "wants" do not match "His wants" then I GLADLY yield my wants on the altar - not because I'm strong or tough - but because I TRUST that IF my Abba has ANY reason to not want me to have something then I trust Him COMPLETELY and I am delighted to NOT have it. DELIGHTED! No regrets! No second thoughts! No Anxious thoughts. No mid-life crises. No fears of the future. No daydreams of the past. Not duped for a minute by the shifter of shadows. My anchor and Hope ARE in a world that HE CAN'T TOUCH! He can't get to any of my stuff... It's not HERE! God has ALL my stuff; and it's very well protected! And he cannot keep my Dad from giving me anything He wants to give me anytime He wants to give it to me. Try to starve me and He'll send the ravens to feed me... And that snake CAN'T take anything from me! Because I'm not holding onto anything... My Father keeps all of my stuff. NONE of my heartstrings or hopes or emotional security lies in the SHADOWLANDS... and that's the ONLY stuff he can touch. He can only shift the shadows... He cannot disturb anything REAL... UNLESS I let him through UNBELIEF!!!!!!!!!!!!!!!!!! 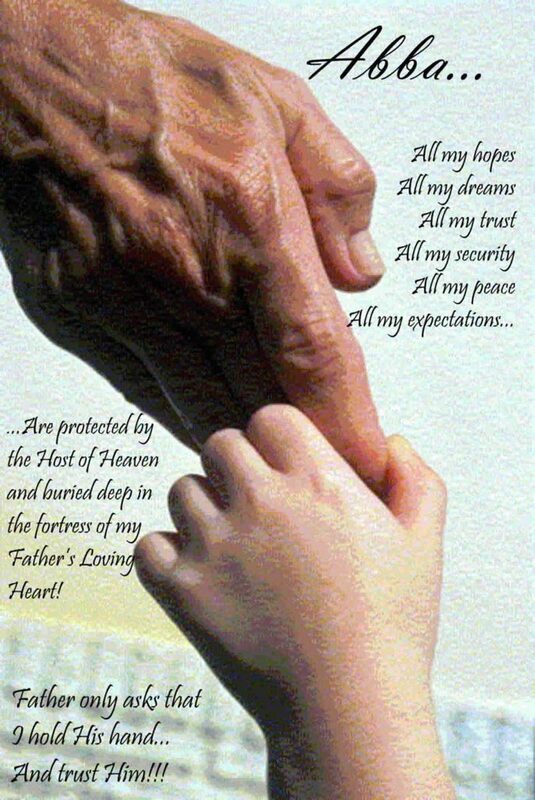 All my hopes, all my trust, all my security, all my peace, all my expectations...are protected by the host of Heaven and buried deep in the fortress of my Father's loving heart. If God is for me, Who can be against me? WOW!! !